In March 2016, a new independent movie theater opened its doors on New York City’s Lower East Side with two films from the Walker Art Center’s collection among its initial screenings. A two-screen cinema complemented by a restaurant, candy shop, and bookstore, Metrograph will present a wide palette of curated selections—from French New Wave to American exploitation and classic documentary—alongside first-run screenings of new independent and foreign titles. Appearing in the the new theater’s inaugural program are two prints from the Ruben/Bentson Moving Image Collection: William Klein’s Broadway by Light (1958) and The French (1982). The Walker’s 35mm print of Broadway by Light preceded Metrograph’s screenings of Taxi Driver last month as part of a metatextual series called “Surrender to the Screen,” which highlighted works depicting the act of film-going. 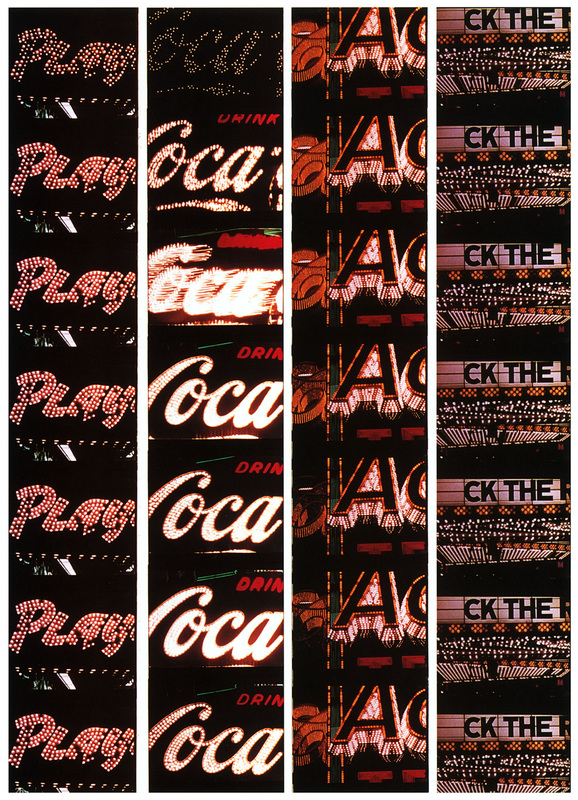 Klein’s debut effort in the medium, Broadway by Light is a 12-minute sequence of filmic verse that takes as its subject the electrified light displays of its eponymous locale: theater marquees (bearing titles like Winchester ’73 and Four Boys and Gun), scrolling news tickers, sparkling cola billboards. Paired with Maurice Le Roux’s semi-dissonant, staccato score, the director cycles through these glowing icons of urban nightlife at a rhythm that is both mesmerizing and somewhat abrasive. Klein—a New York native who has lived in Paris for the past half-century—made Broadway by Light soon after the publication of his photography book Life is Good & Good for You in New York: Trance Witness Revels, and comparisons between the two works abound. Life is Good stood out, in 1956, for its blunt, impressionistic style. Featuring unconventional framing and intense close-ups, Klein’s dynamic, frequently blurry New York street scenes evoke the frenetic pace of city living. Broadway by Light is a similarly visceral affair, employing extreme zooms, overlaid images, and reflected light to create a kaleidoscopic light play. Considered by many—including Klein himself—to be the first film of the pop art movement, Broadway by Light levels a critique at the baroque excesses of American marketing culture, while unabashedly indulging in its seductive vocabulary. Though an American expatriate and effective satirist, Klein is no scold. He doesn’t begrudge the viewer the pleasures of the screen, but instead places these fantasies in context—as the film comes to a close, Broadway’s winking displays are obliterated by the greatest light show of all: the rising sun. In the years following Broadway by Light, Klein transitioned to feature-length films—many documentaries, but also several narrative works firmly planted in the satirical realm. It is for his 1969 film portrait Muhammad Ali, The Greatest (later re-titled Float Like a Butterfly, Sting Like a Bee) that Klein is likely best known. Always adept at gaining access to exclusive subjects—according to the filmmaker, it was a casual encounter with Malcolm X that paved the way for his extensive relationship with Ali—Klein received free rein to film the French Open tennis tournament in 1981. Fascinated by the tournament scenes not readily available to the broadcast viewer, for The French—a 16mm print of which Metrograph has on loan from the Walker—Klein took his camera into the locker rooms, broadcast booths, and banquet halls of the Stade Roland Garros athletic complex in Paris, amassing piles of footage over the course of the two-week tournament. In today’s corporatized sports world, it’s hard to imagine a filmmaker receiving this kind of access. Interactions between players and the media are contractually micromanaged to protect team and league brands and filtered through a hegemonic linguistics of cliched optimism. Pro sports’ culture of platitudes has achieved such ubiquity that when a player departs from the expected script—as Seattle Seahawks running back Marshawn Lynch famously did in the days leading up to Super Bowl XLIX—it makes national headlines. Viewed from this contemporary context, the utter naturalness of Klein’s backstage vignettes feels, paradoxically, almost unreal: men’s runner-up Ivan Lendl’s bashful refusal to undress, following a match, until Klein’s cameras are shut off; Chris Evert (women’s #1) and Virginia Ruzici (#5) crammed side-by-side onto a players’ lounge easy chair, giggling at the clownish antics of the unseeded Romanian Ilie Năstase before their brutal head-to-head match (which Evert handily won in two sets). This is part of what makes The French—which screen April 29–30, as part of Metrograph’s “Welcome to Metrograph: A to Z” series—such a riveting sports documentary. Rather than falling back on conventional journalistic techniques (Klein conducts almost no interviews), the director endeavors to disappear into his environment. 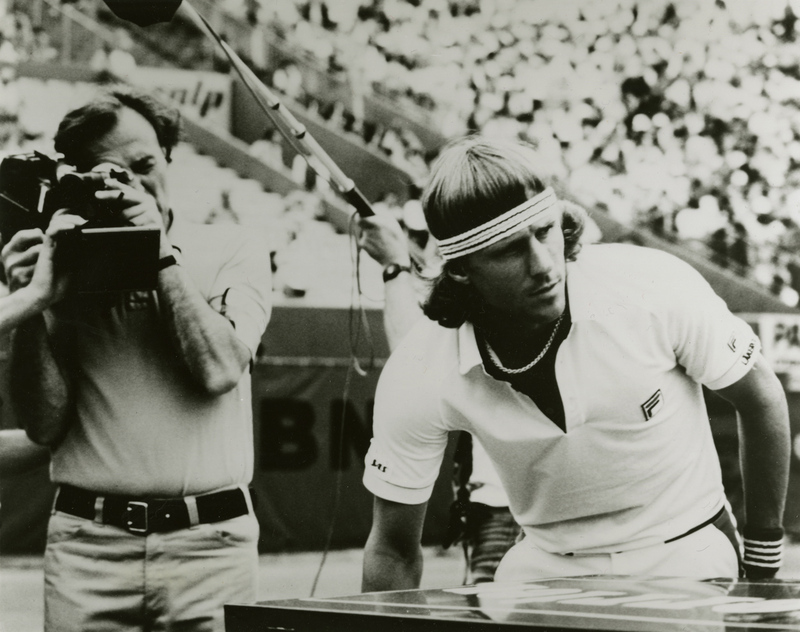 In line with the basic principles of contemporaneous documentary movements like cinéma vérité and Direct Cinema, Klein eschews any real thesis, instead hopscotching between the dozens of mini-narratives his camera happens to find: a ball boy triumphantly snatching Björn Borg’s racquet in the moments following his men’s tournament winner, an ongoing spat between all-time great John McEnroe and a referee, an awkward birthday party for women’s three seed Andrea Jaeger. Yet, despite the cerebral quality of Klein’s immersive, gonzo-adjacent approach, the director doesn’t shy away from the drama inherent to his favorite sport. In addition to being an eye-opening look into the off-court world of pro tennis, The French is also as a generous, if incomplete, documentation of the 1981 tournament, proceeding chronologically through long stretches of match coverage, which the director cleverly pairs with live commentary—from both the broadcast booth and the stands—and dutiful shots of the scoreboard. Klein’s love for the sport is palpable, and it’s only in play that he allows himself a more hands-on, affective approach, complete with Wes Anderson–level frames/second numbers and gratuitous shots of the Coupe des Mousquetaires. Both a close examination of the bureaucratic and promotional systems that buttress the drama unfolding on court and a sincere tribute to a handful of incredible athletes, The French is a startlingly original take on the world of professional tennis. Yet, alongside Broadway by Light, it has failed to find a lasting audience. Unlike Klein’s narrative films, which were released on DVD by The Criterion Collection in 2008, both of the director’s works showing at Metrograph this spring are not readily available for home viewing. Through this collaboration, these vividly rendered, yet unsung titles from the Ruben/Bentson Moving Image Collection will reach audiences in what promises to become a major hub of New York independent film culture. For Midwestern cinephiles unable to make it to the Metrograph screenings, The French can be watched in its entirety in the Walker’s Mediatheque screening room during regular museum hours.